The DIY trend is the ultimate when it comes to customisation. Many restaurants are giving up on the endless list of options and instead are offering their customers a hot griddle and a choice of sides to cook their own meat. Whether this refers to humble a salad bar or self-assemble desserts, the element of customer construction creates a sensation of DIY. This means your steak is cooked perfectly as it sizzles on a hot plate before you, or your coffee has the right ratio of coffee, milk and water, but it also limits the control the kitchen has over the customers’ culinary experience. As the industry moves closer to a completely customisable future, what does this mean for the DIY trend? Whether a restaurant is serving meat you cook yourself, a collection of dipping sauces or even a deconstructed crumble that you build with different toppings- it means a lot of duplication. If each table needs a hotplate, that creates more expense and more work. It can also mean a lot of waste. If every table needs a variety of options and they are not all used, a lot has to get thrown away at the end of service. This is not good for restaurants with a green ethos. The service element of the dining experience is limited. While orders still need to be taken and food brought, the lack of cooking input means customers are often left to their own devices. Many customers are satisfied with this arrangement, but if you are an establishment that prides itself on service, this may not be suitable. There is also a lack of opportunity for a chef to show off their skills. If it is merely deconstructed, then the customer assembling should not make much difference to the flavour balance, but if there is more customer control, it can leave the end result out of the professional’s hands. The food industry is continuing to evolve with complete personalisation being the goal in sight. From having control over the type of milk in your coffee to the order your fajita is layered, every customer wants to feel like their wants and needs are being taken into consideration. The DIY trend is indulging these wants. The time and complication of ordering is reduced. In a conventional restaurant, any additions, substitutes and dietary preferences have to be noted by the servers, passed on to the chef and fulfilled. This can quickly get lost through the grapevine and result in unhappy customers or a beleaguered kitchen. There should also be a reduction in negative responses. As customers have complete control, their steak shouldn’t be overdone nor lacking in enough of a certain topping. If this is a trend that is either impractical or not a good fit for your brand, you can still incorporate elements while retaining some control in the kitchen. A build your own board can include everything from burritos to sundaes and list the options but they still have to be repeated to the server. This reduces waste and duplication and will also allow you to oversee customer flavour and topping preferences. This can then further inform your menu. Serving deconstructed food as opposed to DIY leads the customer to feel involved in their meal making while still having some influence over the final flavour. It allows kitchen staff to unleash their natural flair as well express their creativity with presentation. 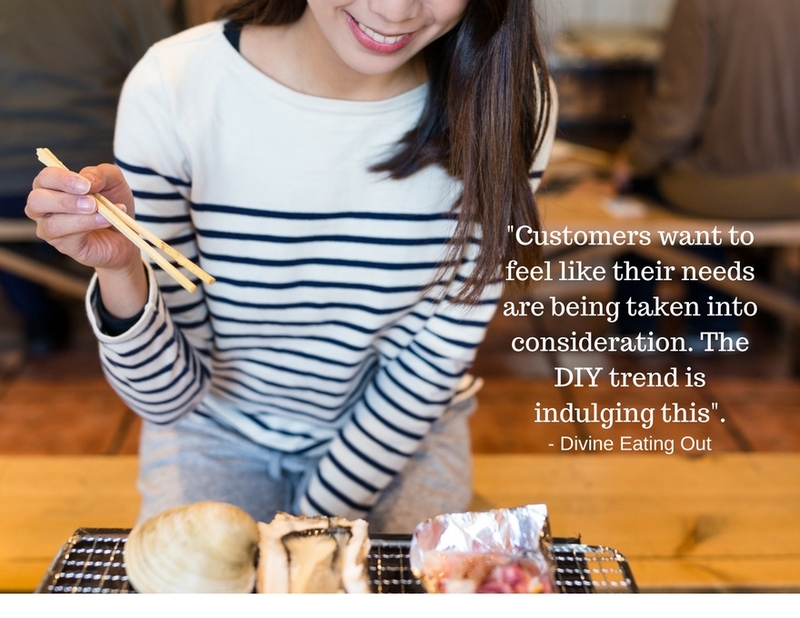 Indulging in the DIY trend in just one aspect can often allow customers to feel they have more jurisdiction over their dinner. This can be an array of accompaniments, a selection of sauces or a trio of toppings that come with each portion. Has YouTube killed the TV chef?